Not a lot to report, caching-wise for the last two days of our stay in New York. On Wednesday, we got up early to go to Times Square and get tickets to see a show on Broadway. On the way, we took the scenic route via the nearest unfound to the hotel which was a virtual cache by a lovely statue. The cache was easy to find as we could see where we needed to go from some distance. After getting some great tickets for a show this afternoon, we had 4 hours to kill so took the subway to Greenwich Village to have a wander around and try and find the few caches that were in the area. We started with a DNF as there were too many muggles around to search for the cache. Then, we did a quick and easy virtual in Washington Square Gardens, just by New York University. A quick Traditional by the side of a park followed, by which time we had to make our way back to Broadway in time for the show. On the way, we bagged one more quick and easy micro. This was to be our last cache in New York for this trip. Today, we did not do any caches as there were none to find anywhere we were at. We opted instead for a really interesting bus tour round the Uptown area, including Harlem. This was then followed by a Downtown tour, taking in all the usual places. By the time we had finished this, there was just time for a nice meal in town, before heading off to the airport and our flight home. A really great trip which was very hectic in parts. We’ll now be glad to get back to sleepy Bolas Heath and some well deserved peace and quiet. 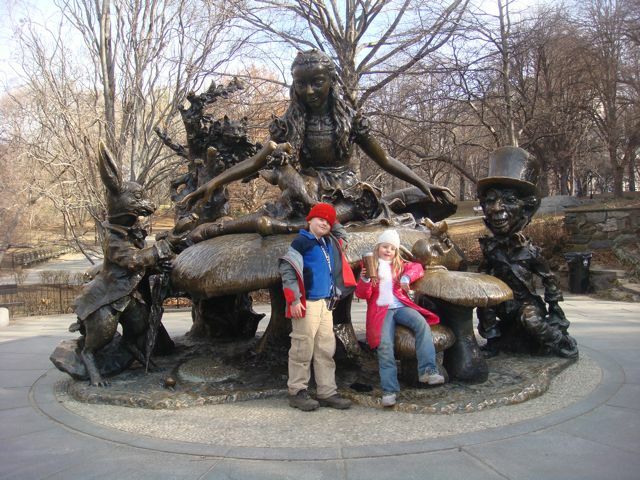 We flew to New York on Sunday and have found quite a few caches already. On Sunday we just had a wander around the area near our hotel (just opposite Madison Square Garden). The nearest cache was a Traditional but we could not find it as the GPSr’s would not settle with all the big buildings around. We gave up and headed off to the Empire State Building for a trip up to see the views at night from the 86th and 102nd floors. While we were there, we took the time to bag the Virtual cache on the 86th floor. On Monday, we decided to have a trip to the Guggenheim, starting off in the west corner of Central Park and walking through the park finding as many caches as we had time to. As Manhattan goes, this is the only real caching hotspot as the rest of the caches on the island are spread out all over the place. On the way, we found the cache near the hotel, after looking at the location on Google Maps and spotting somewhere we’d not thought to look before. 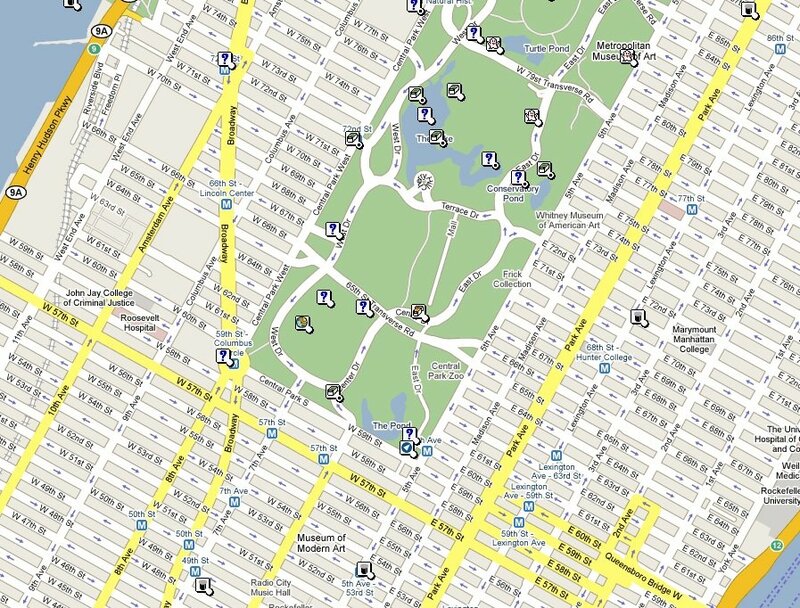 We managed quite a few in Central Park, including some Traditionals, three Virtuals and an Earthcache. Myself and Isaac got fed up with the pretentiousness of the Guggenheim so left Mrs Bolas Heathens and Freya to carry on looking round, while we popped out to find some nearby caches. We managed to find the 4 nearby urban micros and be back at the gallery in time to meet up with the others. Today, we started off checking out the discount show ticket booth in Times Square, before heading off to the Rockerfeller Center, where Freya was really looking forward to trying the ice-skating. While she was doing that, I sloped off to find a nearby uber-urban micro. We then took the scenic route to Ground Zero at the WTC site, via East Village. There was a small cluster of caches based round urban parks here and we enjoyed a walk round the different area in the sun, finding the caches. We then took the subway over to Ground Zero and spent some time taking in the area and thinking of those terrible events that took place here in 2001. Not many caches left to do in the area, but we do hope to find a few more before we go back to the UK on Thursday, including one in New Jersey as it would be rude not to get a new State for our caching map. We’re off for a short break in the Big Apple this Sunday and can’t wait. There are not exactly a ton of caches to do, but enough to keep us busy in between other, more touristy things. We’ve got US Topo Maps on our GPSr’s so that bit is easy. We would like Memory Map to work too but only have the maps for Florida and California, so set about trying to create our own using Google Maps. This turned out to be easier that we though, using the Google Maps Hack at this link. There seems to be a lot of Puzzle caches when you first look at the map, but most of them turn out to be simple offset multi’s where you have to walk a specific distance on a specific bearing to find the cache. Nice and easy as our GPSr’s do waypoint projection. Some of the actual puzzles are a lot trickier and I’ve had to learn about the US Congressional Library, amongst other things, to get the solutions. I bet we don’t have time to find all the ones we’ve solved, but at least we’re prepared, just in case.